A fathom is six feet, so the boatman who says in Telemachus that "There's five fathoms out there" is indicating thirty feet of water in the outer reaches of Dublin Bay where it gives way to open ocean. (Thornton observes, "I have seen several maps of the Dublin Bay area which include a 'Five Fathom Line.'") Somewhere out there the body of “The man that was drowned” on June 7 is being pushed about by the currents and swelling up with gas, and folk wisdom holds that it will surface in “nine days.” Within these realistic details lurks an allusion to Shakespeare's The Tempest that raises metaphysical questions about life after death. The song implies a reconstitution on the other side of death, possibly Christian but more likely not: Ariel sings not of God saving Alonso’s soul but of the sea making something beautiful of his drowned body. However one may read Shakespeare’s powerfully visual and aural image of humanity becoming transformed into “something rich and strange,” the effect is certainly to evoke a mysterious reality on the other side of death. Ariel sings the song to assuage Ferdinand’s grief, to assure him that he lives in a beneficent universe, and to free him to love the young woman whom he is about to meet. These characteristics of Ferdinand’s situation seem peculiarly relevant to Stephen, who is haunted and accused by his mother's death, convinced that he lives in a malignant universe, and eager to discover love. In Proteus Stephen recalls the boatman’s words from Telemachus and makes the implicit allusion explicit: “Five fathoms out there. Full fathom five thy father lies.” As his thoughts continue to play over the boatman’s words (“At one, he said. Found drowned. High water at Dublin bar”), he imagines the “Bag of corpsegas” becoming transformed, not into a celestial spirit, but into all the multifarious forms of physical existence: “God becomes man becomes fish becomes barnacle goose becomes featherbed mountain.” This shifting of corporeal shapes through decomposition and reintegration resembles Shakespeare's "sea-change" by which Alonso's eyes become pearls and his bones coral: "A seachange this, brown eyes saltblue." 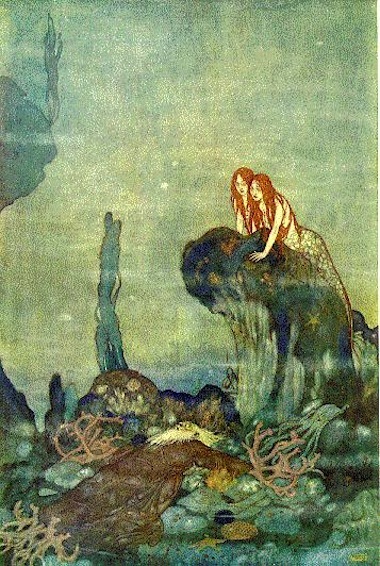 Sea nymphs viewing the body of Ferdinand's father, in a painting by Edmund Dulac. Source: library.wustl.edu.